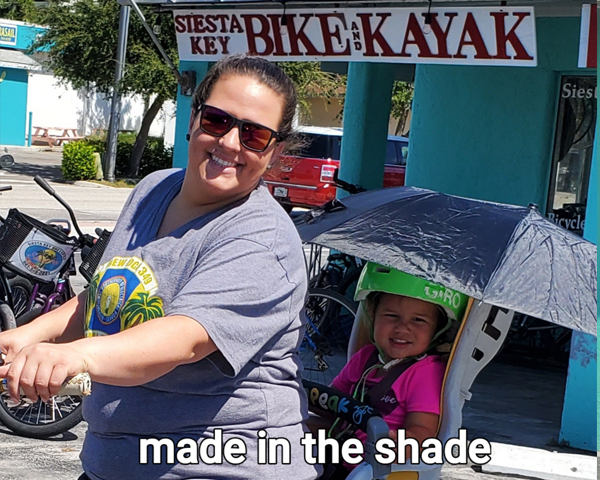 Biking is the most popular activity on Siesta Key. ( Everybody bikes) It is also the best way to explore and get around our island. Bike ride to the beach, breakfast, lunch and dinner. We also offer lights so you can ride after dark and enjoy our famous sunsets and nightlife. You can Bike directly on the beach. Bike on the sidewalk, bike lanes, side streets and our canopy trails. Just off the Island is Legacy trail a 15 mile paved bike trail to Venice Fl. We offer many options for you to experience the trail. Car racks, folding bikes, delivery and pick up or a self guided short cut map to the trail. With over 500 bikes to choose from we have the right bike for everyone. Bikes for the whole Family! We area Fuji, 3g, Sun and Montague dealer. We also rent Cannondale, Specialized, Giant and Trek bikes. All of our bikes are professionally maintained and our expert staff will fit and adjust your bike for optimum comfort and ease. Road bikes aluminum and carbon come with shimano 105 or dura ace components, pump, extra tubes, repair kit.